The Program functionality allows your organisation to participate in a National Discover Sailing Day Program and also set up Discover Sailing Programs at your Organisation so that they appear on the National Program Finder, allowing the public to find your organisation and register to participate. Follow the steps to create a Member Record Type for the Program you are creating. If you are setting up a Discover Sailing Program (i.e. Discover Sailing Day), it's recommended that you set up the following Member Record Type: Discover Sailing Participant. Please ensure that you map this Member Record Type to the appropriate State (Parent) Type. Contact your State Association if you are unsure about how to do this. Please Note: It is important that you set up a Member Record Type to assign to anyone who participates in a Program that your organisation is running. If you do not do this, you will have to assign Program participants a Member Record Type that you use for your Members, meaning Program participants could be included in your membership count. 1. On the Club dashboard, click on Contacts. 2. The Contacts page will appear. 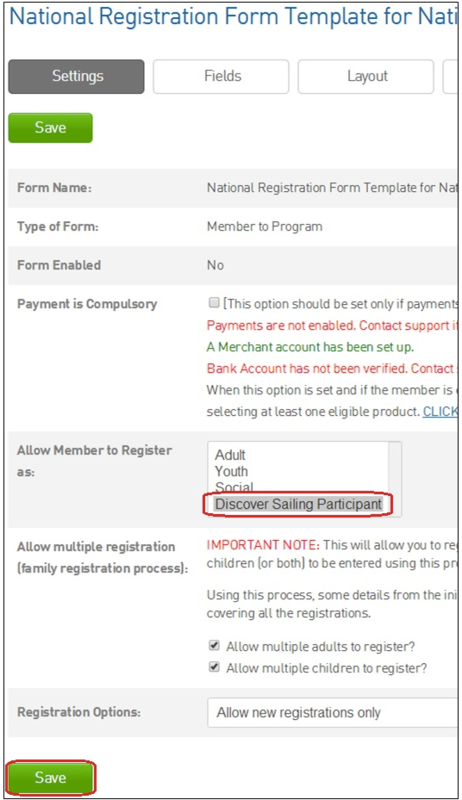 If you are participating in a Discover Sailing Program, you'll need to assign a ‘Discover Sailing Host’, listed under ‘Other Roles and Contacts’. 3. 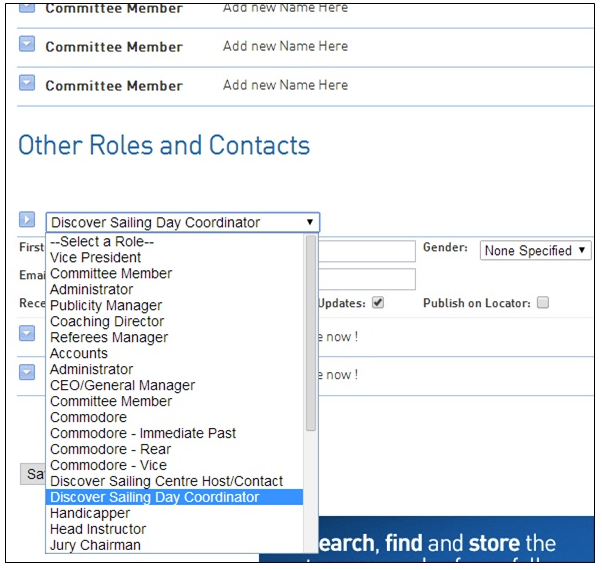 To add a ‘Discover Sailing Day Host’, click on the down arrow and a list of roles will appear. Select the role to add details. You can add multiple people for a role if required. 4. Add the details of the ‘Discover Sailing Host’. 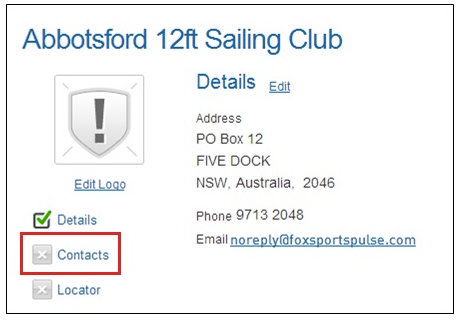 Publish on Locator determines whether the contact person's name and contact details are displayed on the Discover Sailing Locator. 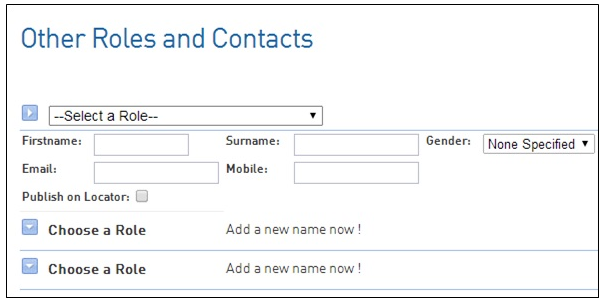 If there is more than one Discover Sailing Host, one person can be assigned the primary contact by selecting the Primary Contact radio button. Publish on Locator must be selected for the Primary Contact. 5. When you have finished adding contacts, click Save. 1. Login to your club database and select Programs in the header. Please note: You need to add a new program for every individual day you run. For example, if one Program is a Monday and the other is a Friday, they need to be set up as individual programs. 3. Choose the Program you wish to create. This can be selected from the drop-down list set by Yachting Australia. Click 'Create Program' when you find the Program that you want to set. 4. The next screen will give you the ability to edit the Program. In this screen you need to complete the Program details specifically for your club. Please note: There are some restrictions that are set by the national body to create a standard national program. All fields that have a red dot against them are mandatory. 4.1. Program Name: The default Program Name will be automatically populated. You can alter the Program name as required. 4.2. Program Type: This indicates the type of sailing your organisation will be offering in a Program: Dinghy, Keelboat, All Abilities etc... Please Note: You'll need to set up a Program for each Program Type you want to offer e.g. if you want to offer Dinghy and Keelboat you'll need to set up 2 Programs - a separate Program for each Program Type. 4.3. Active: By ticking Active, the Program will be made available to the public. 4.4. Location Type: Select Club. This will enable you to select the Locator details for your Club. If you need to update your Club Locator details, please view the support article. Please Note: To be able to add your Club location, the 'Venue Name' field must be populated in the club locator. 4.5. Location: If you have selected Club in the Location Type you will be able to select your Club location. 4.6. Youngest Suggested Age: Insert the minimum age of participants for the Program you are setting up. 4.7. Oldest Suggested Age: Insert the maximum age of participants for the Program you are setting up. 4.8. Oldest DOB: Insert the maximum DOB of participants for the Program you are setting up - optional. 4.9. Allow Oldest DOB exceptions: Tick if you want to allow exceptions to the maximum DOB - optional. 4.10. Youngest DOB: Insert the minimum DOB of participants for the Program you are setting up - optional. 4.11. Allow Youngest DOB exceptions: Tick if you want to allow exceptions to the minimum DOB - optional. 4.12. Start Date: Add an official start date of the program.. For the National Discover Sailing Day the date is fixed as Sunday, 26 October 2014. 4.13. Start Time: Add the Program Start Time in 24 hour format. Please Note: If you want to run different times for a Program, you'll need to set up a Program for each time you want to run a Program e.g. if you want two times (10am - 12pm & 1pm - 3pm), you'll need to set up 2 Programs - a separate Program for each time. 4.14. Capacity: Add the maximum participant Capacity for the program you are setting up. If you do not have a limit on the capacity and want to take all participants simply enter a very high number. Please Note: Once the number of people registered for a Program reaches the capacity you have set, no additional people will be able to register for the Program. It is advised that you set the capacity slightly above what your Club can manage to account for people who register for a Program but do not attend. e.g. if your Club can manage 100 people, set the capacity at 110. 4.15. Duration: Enter the Program duration (in minutes). 4.17. Days Run: Enter the day of the week that the Program will be running. Ensure that the day of the week matches your start date. 4.18. Default status of new Members on Enrolment: Set as Active. Once you have added the required details click 'Create Program'. 1. If you haven't already set up a Member Record Type for the Program you are setting up, please view the following article: Setting up Member Record Types. If you are setting up a Discover Sailing Program (i.e. Discover Sailing Day), it's recommended that you set up the following Member Record Type: Discover Sailing Participant. Please ensure that you map this Member Record Type to the appropriate State Type. Contact your State Association if you are unsure about this. 2. To assign the Member Record Type to the registration form, navigate to the 'Registration Forms' section. 3. 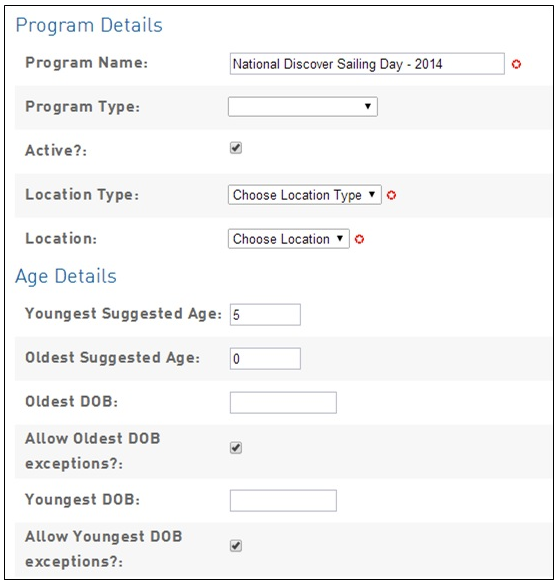 Edit the National Registration Form Template for Discover Sailing Day. If you have followed the steps above, the Program will be set up and participants will be able to find the details for your club when searching on the Discover Sailing website and register for the program. 5. To view and manage the list of Programs set-up for your club, click on Programs in the header.